Cephalexin is used in both dogs and cats to treat a variety of bacterial infections, including skin infections, wound infections, bone infections, pneumonia, and bladder infections. An oral cephalosporin antibiotic used to treat many common bacterial infections in dogs and cats (ex. urinary tract, skin and soft tissue, bone and respiratory tract infections). Cephalexin may be given with meals. Cephalexin is similar to the veterinary drug cefadroxil, and veterinarians often use the two drugs interchangeably. Different dosages are used to treat different bacterial strains and infections in different parts of the body, however, cephalexin is usually prescribed at a dosage of 20–30 mg/kg. The medication is generally given via oral tablets, and administered every 8 to 12 hours (one to three times per day). What is Cephavet used for? Cephavet Oral Suspension 25mg/mL is a broad spectrum antibiotic specifically used to treat a wide range of infections in cats and dogs, caused by a variety of susceptible bacteria. These include skin and soft tissue infections like infected wounds, abscesses, and lacerations. Cephavet Oral Suspension 25mg/mL is also used to treat infections of the respiratory tract and urinary tract; also, infections of the bones and joints. Cephavet Oral Suspension 25mg/mL is a dry syrup that makes it easy for your pet to swallow. Cephavet Oral Suspension 25mg/mL is only suitable for animals. Cephavet Oral Suspension 25mg/mL contains cephalexin, a semi-synthetic, first generation cephalosporin antibiotic, belonging to a sub group of the beta lactam group of antibiotics (which include penicillins). Cephalexin in Cephavet Oral Suspension 25mg/mL inhibits the synthesis of the peptidoglycan layer of the bacterial cell wall, which is important for the structural integrity of the bacterial cell wall. Blocking formation of the bacterial cell wall in susceptible bacteria kills the bacteria. Unlike other beta lactam antibiotics like penicillins, cephalosporins are less susceptible to destruction by beta-lactamase found in some resistant bacteria. Cephalexin in Cephavet Oral Suspension 25mg/mL is effective against a wide range of bacteria including Staphylococcus aureus, Streptococcus pneumoniae, Streptococcus pyogenes Haemophilus influenzae Klebsiella pneumoniae Moraxella catarrhalis and Proteus mirabilis. 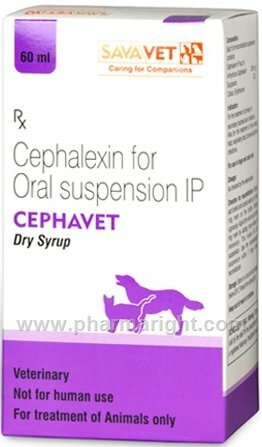 Cephavet Oral Suspension 25mg/mL contains the active ingredient cephalexin monohydrate, a cephalosporin antibiotic belonging to a sub group of the beta lactam group of antibiotics, which is used to treat a wide range of bacterial infections in cats and dogs. Cephavet Oral Suspension 25mg/mL contain cephalexin, a cephalosporin antibiotic belonging to a sub group of the beta lactam group of antibiotics (which include penicillins). Cephalexin in Cephavet Oral Suspension 25mg/mL works by inhibiting the synthesis of the bacterial cell wall in susceptible bacteria, which kills the bacteria. 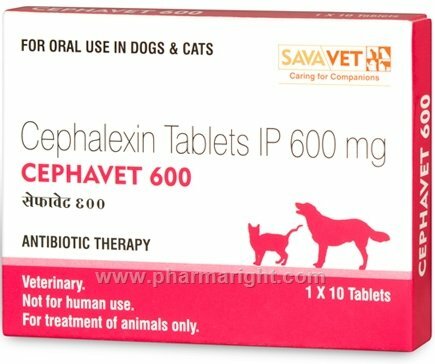 Cephalexin in Cephavet Oral Suspension 25mg/mL is effective against bacterial infections in cats and dogs, caused by a wide range of bacteria including skin and soft tissue infections like infected wounds, abscesses, and lacerations; respiratory tract and urinary tract infections; and infections of the bones and joints. What are the side effects of Cephavet? The most commonly reported side effects when taking Cephavet Oral Suspension 25mg/mL include allergic reactions, vomiting, diarrhoea, nausea, decreased appetite, weight loss. When should Cephavet not be used? How should Cephavet be taken? The usual dose of Cephavet Oral Suspension 25mg for dogs and cats is 22-30 mg/kg (10-13.6 mg/lb). You should continue to give Cephavet Oral Suspension 25mg/mL to your pet for as long as recommended by your veterinarian, which is usually for at least 3 days after your pet’s symptoms have improved. How long should you give Cephavet? If you miss a dose of Cephavet Oral Suspension 25mg give it as soon as you remember, unless it is time to give the next dose, then skip the missed dose. Do not give a double dose.